Crisp, golden brown, roasted chicken always reminds me of family Sunday dinners. This recipe is really quite easy, and yet tastes delicious flavored with the lemons, garlic and rosemary. I often cook baby red potatoes in their skins along with the chicken, but you can omit them if you choose. I’d serve the chicken with a side of sauteed greens as well as the potatoes. 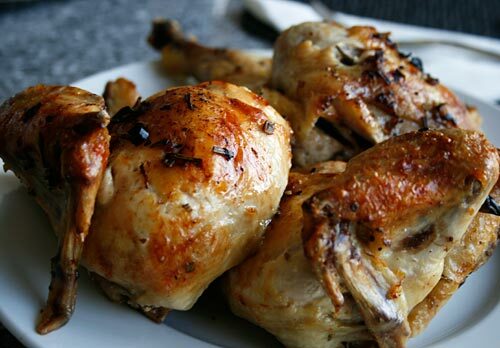 Roasted chicken is an easy main course that is special enough for entertaining. Place the chicken quarters in this dish, and turn the pieces to coat with the mixture. Cover with plastic wrap, and let sit in the refrigerator for one to two hours. Preheat the oven to 425 degrees F. Place the dish with the chicken into the oven, and cook for 20 minutes. Turn the chicken pieces, and add the potatoes if using into the pan with the chicken, coating them with the chicken's juices. Reduce the heat to 375 degrees F., and cook an additional 50 minutes to an hour, or until the juices run clear when the chicken is pricked, and the potatoes are tender when pierced with a fork.